The formation of counties was one of the first matters attended to by the Lords Proprietors after they received their charter in 1663 from King Charles II for the vast tract of land in America he called the province of Carolina. In 1664 the Proprietors formed "all that parte of the province which lyeth on the north east side or starboard side entering of the river Chowan now named by us Albemarle River together with the Islands and Isletts within tenn leagues thereof" into a county that they named Albemarle County for George Monck, the duke of Albemarle, himself one of the Proprietors. This was the site of the first permanent settlement in Carolina. They then divided the new county into four precincts: Currituck, Perquimans, Pasquotank, and Chowan. 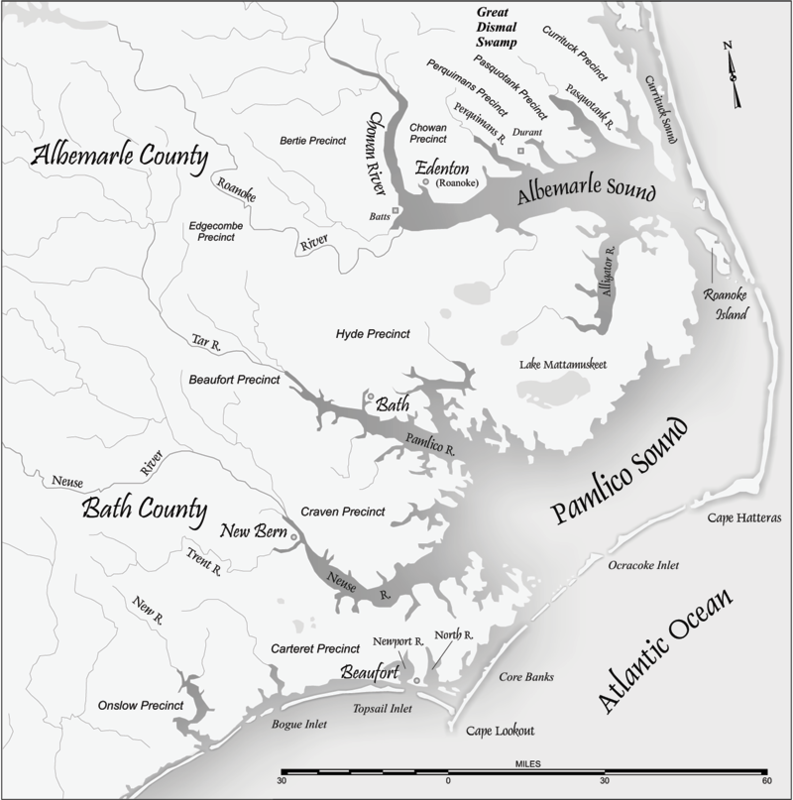 Albemarle County was subsequently enlarged, and in 1696 the area south of Albemarle Sound was removed from Albemarle and made into a new county, named Bath, which in turn was divided into the precincts of Beaufort, Hyde, Craven and Carteret. The primary reason for establishing counties (or precincts) was to provide local seats of government where citizens could record documents, such as deeds or wills, and participate in court proceedings. At the same time, the sheriff was provided with a home base from which to fulfill his basic responsibilities of collecting taxes and maintaining law and order. By 1738 Albemarle and Bath Counties had been dissolved and the 14 precincts then in existence became counties, a designation that has remained since the seventeenth century. Throughout the remainder of the colonial period, as settlement spread westward and population increased, older counties were divided and new ones formed. With statehood came an even greater rate of growth, and by 1800 the number had risen to 59 counties covering all of the state. In many cases, the dividing of counties caused heated political controversy, as eastern counties were often divided to maintain that region's majority in the state legislature against expanding representation from the piedmont and mountain regions. Shifts in population continued throughout the nineteenth century and into the twentieth century, resulting in even more counties. Larger counties were divided, and those in turn were sometimes divided yet again, until the seemingly magical figure of 100 was reached in 1911. (For a time, the number of counties was actually greater than 100, but some of these were ceded to Tennessee in 1789 and others were absorbed into other counties or never fully developed.) The number remained at 100, although in 1933 the General Assembly authorized the consolidation of existing counties subject to approval of the electorate. This could have resulted for the first time in a decrease from the 100 county figure, but as of the early 2000s there had been no such consolidations. Initially, county government and judicial matters were in the hands of justices of the peace, who formed a body known as the Court of Pleas and Quarter Sessions. The justices were appointed by the governor, with strong input from the members of the colonial Assembly from the affected county, leaving the average citizen with no say as to who would run the government of the county in which he lived. At first the Court of Pleas and Quarter Sessions met wherever it was convenient to assemble a quorum, usually in a private home. A 1722 act of the Assembly instructed the justices to pick a site for a permanent seat of government for each precinct, where they were to buy an acre of land and build a courthouse. Whether in the early precinct days, or after the name of the local government entity was changed from precinct to county, the justices had the support of a sheriff for law enforcement, as well as a clerk of court and a register of deeds. Of the three, both the clerk of court and the register of deeds needed to remain in their offices in the courthouse, which left only the sheriff free to travel about the county. Accordingly, he was also designated tax collector, a position sheriffs continued to hold until the latter part of the twentieth century. The general system of county government of the early colonial period, with the appointed members of the Court of Pleas and Quarter Sessions running things, was carried over into statehood, and little changed until the adoption of the North Carolina Constitution of 1868. The system called for by the new constitution, known as the Township and County Commissioner Plan, gave control of county government to five commissioners, to be elected at large by the county's voters. In addition, each county was divided into townships whose residents elected two justices to serve as the township's governing body, as well as a three-member school committee and a constable. The new system significantly reduced the General Assembly's control of county government, since the legislators no longer appointed the justices of the peace who made up the county court. The Township and County Commissioner Plan, patterned after one previously adopted in Pennsylvania, did not prove universally popular in North Carolina and lasted less than a decade. At a constitutional convention in 1875, the General Assembly was authorized to change the system, and in the session of 1877 townships were reduced to little more than geographic and administrative subdivisions of the counties. This seriously reduced the authority of county commissioners. The modern system of county government, in which an elected board of commissioners is responsible for managing a county's affairs, including setting the rate and collecting taxes and determining where funds should be expended, dates to the early twentieth century. Periodically after that, the General Assembly conferred additional authority and responsibility on the county commissioners, until at the end of the century they had been provided with such a wide range of "home-rule" statutes that many counties found it impossible to run their greatly expanded business without professional help. This led to the adoption by many counties of the County Manager Plan. Under this plan, commissioners employ a county manager to serve as a sort of chief executive of the county business-in some instances, the largest business in the county-with the manager having certain independent authority, including that of hiring and firing employees. As with other matters, the state determines what sources the counties may tap for income. Traditionally, the real estate tax has been the primary revenue source for North Carolina counties. However, especially in the last half of the twentieth century, counties were able to prevail on the General Assembly to let them collect from a variety of other sources, among those favored being local sales taxes, land transfer taxes, meals taxes, and occupancy taxes. A. Fleming Bell, ed., County Government in North Carolina (3rd ed., 1989). David LeRoy Corbitt, The Formation of the North Carolina Counties, 1663-1943 (1969).